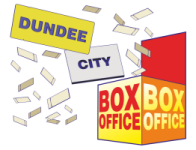 The following sets out the Terms and Conditions or rules that govern the purchase by You of tickets from Us (Leisure and Culture Dundee, Scottish Incorporated Organisation Number SCO42421 and having our principle offices at 1 Shore Terrace, Dundee DD1 3AH) via the Dundee City Box Office Website. You expressly agree to be bound by these Ticketing Terms and Conditions and all applicable laws. The Effective Date of these Terms and Conditions is 1 July 2016. We may change these Ticketing Terms and Conditions from time to time. You should therefore check the Effective Date each time you visit the Site. Tickets for all events or performances sold via this Website are sold by Us as agent for the promoter or organiser of the event or performance. Details of the identity of the Event Promoter are made available on the front of the ticket where reasonable to do so, otherwise details are available on request from the box office. Tickets issued by Us on behalf of the promoter or organiser are subject to these Ticketing Terms and Conditions, together with any other additional terms, conditions or directions which may be shown on the ticket or otherwise made known to You. provide alternative tickets at the event or performance should the staging of the event or performance so require eg due to unavoidable seating changes. Tickets are not transferable and You may not resell them for profit or commercial gain or use them in promotions or packages without the prior written permission of Us or the promoter or organiser. All tickets purchased via our website are subject to a £2.50 transaction charge. Tickets will be sent by post to the address provided by You. Tickets held for collection at the venue box office can be collected on the day of the event or performance. The cardholder should collect the tickets in person, together with the card used to purchase the tickets. The cardholder may be asked to sign for the release of the tickets. You must produce a valid ticket to attend the event or performance and removing parts of, defacing or otherwise altering Your ticket may render it void. Lost, destroyed or stolen tickets may not be replaced. Tickets cannot be returned to the venue box office after purchase, unless the event or performance is cancelled. Refunds in the event of cancellation will not under any circumstances exceed the face value of the tickets. There will be no exchanges of tickets to another event or performance or refund of any applicable delivery charges, booking fees or other charges. Refunds will only be made to You the purchaser and not to the ticketholder. Refunds will not be made at the venue and will be made within a reasonable time period following the scheduled event or performance. If the tickets are returned to Us as addressee unknown or are otherwise undeliverable, We and/or the promoter or organiser reserves the right to cancel the order. It is Your responsibility to check tickets upon receipt to ensure that all details are correct. Please contact Us immediately if you have any queries. You are advised to check timings with the venue before travelling as late changes may be made. If You experience any problems with your seating enjoyment prior to or during the event or performance please inform venue staff immediately as issues cannot be resolved after the event or performance. Payment shall be made in GBP by MasterCard, VISA, or such other payment card that We may authorise when an order is placed. Payment will be debited from the account given before the dispatch of tickets. We will take all reasonable care to keep order and payment details secure, but purchases from this website are at Your risk. Credit card sales transactions will however be encrypted. You undertake that all details you provide to Us for the purpose of booking, ordering or purchasing tickets or any other goods or services via the Website are correct, that the credit or debit card you are using is Your own and that there are sufficient funds to cover the cost of the ticket or other product or service. If there are any changes to the details supplied by You, You must inform Us as soon as possible. The right to refuse admission or to eject customers in reasonable circumstances (for example taking health and safety, environmental and security concerns into account) is reserved to the management and security staff at the venue where the event or performance is taking place, who may on occasion have to conduct security searches to ensure Your safety and that of other patrons attending the event or performance. You and other patrons may be refused entry or ejected from the venue on account of being (or appearing to be) under age (where relevant), declining to be searched, abusive, threatening, drunken or other anti-social behaviour, carrying offensive weapons or illegal substances or are otherwise in the opinion of the Venue management adversely affecting other patrons' enjoyment of the event or performance. No refunds will be offered to patrons who are refused entry or ejected in such circumstances. No cans, bottles, alcohol or food to be taken into the venue and such items may be confiscated. Only food and drink purchased on the premises may be consumed in the Venue. No cameras or video or audio recording equipment are permitted within the venue without the express permission of the promoter or organiser. Use of such cameras or video or recording equipment may cause You to infringe copyright laws. Any such cameras or other equipment being used without such permission may be confiscated. Latecomers will only be admitted into the venue auditorium at a suitable break in the performance and at the discretion of the venue management staff. Any venue plans shown via this Web-site or otherwise show indicative seating layout(s) only. Venue management reserves the right to change allocated seats at short notice depending on individual production requirements and/or for any other operational reason. By attending the event or performance You consent to being photographed filmed or recorded as part of the audience for security and such other purposes as We may reasonably determine. We may broadcast, publish, and use any such photographs, films, recordings in perpetuity. The promoter or organiser reserves the right to alter or change the event programme or content at any time. We acts as agent only and have no control over the event programme or content. We disclaim any liability for the standard of performance at or artistic content of any event and any complaints in that regard should be made directly to the promoter or organiser. Except as required by law, We shall have any further liability to You beyond the face value of the tickets purchased. We shall not be responsible to You or any other ticket holder for any indirect losses or damages including, but not limited to, loss of enjoyment, goodwill or profit and/or travel or accommodation expenses. These Terms and Conditions shall be deemed to apply to all tickets sold via this Website.